Gov. Palin: Let’s win on November 4th! Our current leaders have passed some of the worst policies in our history, damaged our economy and our nation’s standing in the world like never before, and cluelessly snubbed important friends and allies, like Israel. It’s long past time to turn things around; it must happen! This year we have been blessed to travel across this great country of ours, helping good citizen candidates like never before — including more than 30 specific high-profile candidates that YOU helped put on the map, and they appreciate all of you working with and supporting SarahPAC! We’ve supported fierce underdogs like T.W. Shannon and Chris McDaniel who fought valiantly to lead our country away from disaster and took the chance to stand up for what is right. I want to personally thank you for everything you did to help support all of these good people. These races showed us that we can’t hold anything back in this fight to better our country. Together we are supporting these great folks, and we WILL make that change that is so needed. 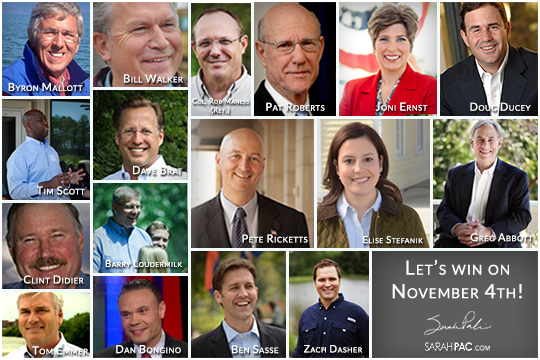 Conservatives like Ben Sasse in Nebraska, Pat Roberts in Kansas, Tim Scott in South Carolina, Joni Ernst in Iowa, and Rob Maness in Louisiana are ready to help usher in the Republican majority in the U.S. Senate. It’s time we have people who are willing to stand up to Obama Administration. Conservatives like Barry Loudermilk in Georgia, Dave Brat in Virginia, Clint Didier in Washington, Tom Emmer in Minnesota, Zach Dasher in Louisiana, Dan Bongino in Maryland, and Elise Stefanik in New York are ready to join conservatives in the U.S. House and stand up not just for what is right but to hold firm to change what is wrong. Conservatives like Doug Ducey in Arizona, Pete Ricketts in Nebraska, Greg Abbott in Texas, and Bill Walker and Byron Mallott in Alaska are ready to take the helm as governors to lead their states as strong conservatives. Please encourage your friends and family to vote for conservatives. Election Day is Tuesday, November 4th! We cannot have November 5th be the day we wish we could have done more. November 5th must be the day we look at a different America, one grounded in principle and prosperity. With an Alaskan heart we thank you all for your faith, values, and common sense. Make November 4th a day that changes our country for the better! While running for president, Barack Obama recited a litany of grandiose promises to Americans – from uniting the nation to healing the planet. It’s been six years and you can judge for yourself if those promises have been kept. Recently President Obama told voters his policies and accomplishments are on the ballot in tomorrow’s election. Good! We have the opportunity to show him what we think of his broken promises. Please enjoy this video and remember to vote tomorrow! On Sunday, former Alaska Governor Sarah Palin said Mitt Romney is in “never never land” on amnesty, blasting the establishment Republican for declaring two days before the midterm elections that Republicans would pass an amnesty bill if they win back Congress. Appearing on Fox News Sunday, Romney, who is viewed as the current North Star of the “pale pastels” GOP establishment, said Republicans would get amnesty legislation “done” if they win back Congress on Tuesday. “So, we’re going to get it done, I think,” he added. Establishment Republicans like Jeb Bush have also said Republicans should pass amnesty legislation if they win back Congress even though studies have shown that Republicans can win elections in 2014 and beyond without passing massive amnesty legislation. Romney made his remarks even though Republicans may take back Congress because Americans disapprove of President Barack Obama’s lawlessness on illegal immigration and his promises of more executive amnesty for illegal immigrants. For instance, Republican New Hampshire Senate candidate Scott Brown may defeat Sen. Jeanne Shaheen (D-NH) because of the illegal immigration issue. Brown, who was trailing Shaheen by double digits, surged after focusing on illegal immigration. A recent Fox News poll found that illegal immigration is Obama’s worst issue going into the midterms, which explains why Senate Democrats begged Obama to delay his executive amnesty until after the midterm elections. And multiple national polls have found that a plurality of voters would be “less likely” to vote for candidates who support a pathway to citizenship for illegal immigrants.